“Stocks wrapped up their worst January on record with a final plunge on Friday. Just wondering? Are investors unwilling to see any more of the economic plans of the new administration of President Obama and the current U.S. Congress? "The budget should be balanced. Public debt should be reduced. The arrogance of officialdom should be tempered, and assistance to foreign lands should be curtailed, lest Rome become bankrupt."
“For example, the "stimulus" package includes $50 million for the National Endowment of the Arts to help "the arts community throughout the United States." Wouldn't want our economy to get behind in the international arts competition. The government is going to borrow $50 million out of the private economy to spend on this, which will result in a net loss of economic output rather than a net gain. “Another $2.1 billion is for Head Start, another program not previously known for stimulating the economy. A further $2 billion is to be spent on Child Care Development Block Grants, which provide day care. We are going to revive economic growth through the federal government spending billions on babysitting, rather than tax cuts for capital investment. A similar initiative involves $120 million to finance part-time work for seniors in community service agencies. “Apart from the tax cuts in the bill, this political spending spree would require Washington to increase its plunder of the private sector (unless it plans to print the money and create an inflation risk). “Already federal spending as a portion of the economy is at 21%, more than four times the rate from the pre-Depression 1920s. It is projected to grow to 29% of GDP in 2030 and 42% in 2050, the same year that state and local government spending is expected to hit 20% of GDP. “Where will all that spending get us? “Think of England, where the British government's share of local output and spending is now 70% in some regions. In the northeastern part of the country, the London Times reports, "the state is expected to be responsible for 66.4% of the economy this year, up from 58.7% when a similar study was carried out four years ago." “Highly revealing is this fact: "When Labour came to power, the figure was 53.8%." Read the Stimulus -- "somebody needs to read it." Congressional Budget Office’s cost estimate of H.R. 1 (requires Adobe), the American Recovery and Reinvestment Act of 2009, the so-called stimulus bill. National Taxpayers Union’s Fight the Stimulus Hoax tool kit. As the chart above shows, the nation’s real national debt totals $56.4 trillion -- about $184,000 per person or $483,000 per household. The chart is from the Peter G. Peterson Foundation, which focuses on increasing awareness on such national challenges as the budget deficit, the national debt, and the viability of Social Security and Medicare. The National Taxpayers Union has a “Fight the Stimulus Hoax tool kit for “taxpaying Americans . . . to tell Congress: ‘Quit digging us into a fiscal hole’” (emphasis added). “ . . . a time machine in the sense that it's based on an old, and largely discredited, economic theory. As Harvard economist Robert Barro pointed out on these pages last Thursday, the "stimulus" claim is based on something called the Keynesian "multiplier," which is that each $1 of spending the government "injects" into the economy yields 1.5 times that in greater output. There's little evidence to support this theory, but you have to admire its beauty because it assumes the government can create wealth out of thin air. If it were true, the government should spend $10 trillion and we'd all live in paradise. By the way, you can join listeners of the Mark Levin Show by calling all 188 representatives in the House who voted for taxpayers and against tyranny; the main switchboard number on Capitol Hill is (202) 224-3121. To see how members of the House voted, see the final roll call vote. "Maybe we ought to see that every person who gets a tax return receives a copy of the Communist Manifesto with it so he can see what's happening to him." “They are buying what politicians are most interested in — power. “This administration and Congress are in a position to do what Franklin Roosevelt did during the Great Depression of the 1930s — use a crisis of the times to create new institutions that will last for generations. “To this day, we are still subsidizing millionaires in agriculture because farmers were having a tough time in the 1930s. Video: Stimulus: Good for Government, Bad for the Economy. Pigging out! That is pretty much the bottom line from a meeting on Friday, January 16, 2008 that was requested by Arlington’s U.S. Rep. Jim Moran (D) to brief County Board members, and their cohorts from other local governments in Northern Virginia, on the federal stimulus package. Although the public was invited, I believe I was the only member of the "public" in attendance. We growled about the stimulus bill on Wednesday, January 21, noting that a number of pro-taxpayer groups have organized the ReadtheStimulus.org website, including a searchable public database of the spending projects of the type that Rep. Moran used to get local officials excited about feeding at the trough. Moran used the opportunity to play what liberals like to do, i.e., class warfare. For example, telling attendees there is a maldistribution of the nation’s wealth, or blaming the 2001 and 2003 tax cuts. Schultz’s article included a “preliminary list” of local Arlington projects that could be funded with federal money. So will Arlington officials reduce our taxes by the amount received for this projects from federal taxpayers? Not likely at all; therefore, Arlington taxpayers will pay for those projects twice. Once through their federal taxes, and again from their local taxes since Arlington officials will not reduce our taxes by that amount. “In his new position, Secretary LaHood will preside over the distribution of tens of billions of tax dollars for transportation projects in the stimulus package that is moving forward in Congress. In addition to control over these vast sums, Secretary LaHood will be involved in the transportation reauthorization bill that will be implemented in 2010. Similar legislation, including the 2005 reauthorization bill, has increasingly become a vehicle for billions in congressional pork-barrel earmarks, including the notorious Bridge to Nowhere in Alaska. “Thank you for contacting me with your views about federal assistance to domestic automobile manufacturers and the U.S. Senate's debate of relevant legislation in December 2008. I appreciate your taking the time to share your thoughts with me, and I understand the concerns you raise. “As you know, the ongoing economic crisis and credit crunch have created an environment that threatens the existence of U.S. automakers. Proponents of offering financial assistance to U.S. auto manufacturers state that one in every ten American jobs is tied to the automotive industry. Proponents also argue that a collapse of the major U.S. auto manufacturers would put hundreds of thousands of autoworkers out of their jobs and would send ripples throughout our already struggling economy. In Virginia alone, there are almost 50,000 jobs that are directly connected to the auto industry, in the form of parts and suppliers, dealers, and assembly plants. On the other hand, opponents of federal assistance to automakers argue that the circumstances now facing U.S. manufacturers are a product of corporate mismanagement and poor business decisions and that taxpayer-funded assistance would be unfair. “After careful analysis, on December 11, 2008, I voted to advance bipartisan Senate legislation that would have provided a bridge loan - not a bailout - for the domestic American automobile manufacturers. Unfortunately, a minority of senators filibustered consideration of this bill. I believe that blocking consideration of this important legislation was a misapplication of the priorities that should govern our political leaders. Quite simply, it is inequitable to earlier support a $700 billion bailout for mismanaged financial institutions that largely protect exorbitant executive compensation, and yet not support this loan package, which was designed to provide cash-flow that would have helped millions of working men and women. “Senate opposition to this bridge loan legislation was based on the faulty argument that unionized auto workers are too highly compensated. However, subtracting from the average United Auto Worker (UAW) compensation the money needed to support retirees' health insurance and pension expenses, UAW workers take home about the same wages as non-union workers at foreign-owned car plants in the United States. “If ensuring parity in pay between union workers and workers in non-unionized plants is a priority, then parity should be applied evenhandedly to company executives. The average American CEO makes 400 times what the average worker makes, while the average Japanese CEO makes only 10 times what a Japanese worker makes. “The health of our nation's domestic auto manufacturers, suppliers and dealers is as important and as deeply woven into the fabric of our economy as the health of Wall Street. In that light, I will carefully examine any policy proposals related to this matter - with your views in mind - to ensure that they are fair, that they protect hard-working Americans, and that they strengthen our economy. “I hope you continue to share your thoughts with me and my staff in the years ahead. I also invite you to visit my website at www.webb.senate.gov for regular updates on issues that are important to Virginia and our nation. “Thank you once again for contacting my office. To contact Sen. Webb’s, click here. "The more corrupt the republic, the more numerous the laws." You can read the stimulus bill as well as the committee report at READTHESTIMULUS.ORG. Congratulations are due to staffers from the National Taxpayer Union and Citizens Against Government Waste for the protest they staged this past Saturday against the U.S. Conference of Mayors’ porky wish list. Here is the NTU press release, which offers an alternative to the U.S. Conference of Mayors’ wish list. 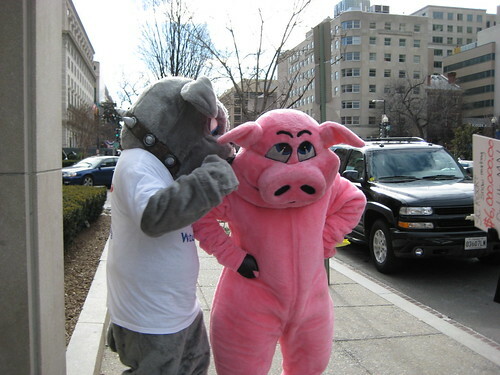 The following picture of Pitbull and Pig from Saturday's pork protest is from NTU’s blog, Government Bytes; two other pictures are available there. Put me in the “nature, not human activity” camp when it comes to global warming so even though livestock produce methane “as part of the normal digestive process in animals,” the need to regulate livestock emissions is not called for. For more on the topic, see “Nature, Not Human Activity, Rules the Climate,” and other publications, at the Science & Environmental Policy Project website. However, if you are a believer in global warming, and want to know more about livestock emissions, see this document (requires Adobe Acrobat) at EPA’s climate change website. Sheesh! Just what the country needs, more regulation. To contact EPA to express your views: visit this EPA webpage. “It is the first credible date that may become iconic as the moment when the federation that came into existence in 1776 and rose to global hegemony in the 20th century joined Macedonia, Rome and Britain in the catacombs of fallen empires. Barack Obama is America's nemesis. ”Barack Obama's inauguration address on Tuesday will be big on rhetoric: that is what he does. The plan he will trumpet will be a failure economically; but it may well prove a success in achieving its author's agenda – reducing the US to a Keynesian theme park like the ones based in Brussels, Paris and, most recently, London." Sometimes we need a foreigner to tell us what our eyes are unable to see. More than a week has gone by since the Wall Street Journal posted Stephen Moore’s essay, “'Atlas Shrugged': From Fiction to Fact in 52 Years,” and it is still ranked on their Opinion Journal webpage as the second most e-mailed article. While there may be no statistics to track such trivia, I cannot recall any other news article staying “popular” for so long. “Many of us who know Rand's work have noticed that with each passing week, and with each successive bailout plan and economic-stimulus scheme out of Washington, our current politicians are committing the very acts of economic lunacy that "Atlas Shrugged" parodied in 1957, when this 1,000-page novel was first published and became an instant hit. “Rand, who had come to America from Soviet Russia with striking insights into totalitarianism and the destructiveness of socialism, was already a celebrity. The left, naturally, hated her. But as recently as 1991, a survey by the Library of Congress and the Book of the Month Club found that readers rated "Atlas" as the second-most influential book in their lives, behind only the Bible. “For the uninitiated, the moral of the story is simply this: Politicians invariably respond to crises -- that in most cases they themselves created -- by spawning new government programs, laws and regulations. These, in turn, generate more havoc and poverty, which inspires the politicians to create more programs . . . and the downward spiral repeats itself until the productive sectors of the economy collapse under the collective weight of taxes and other burdens imposed in the name of fairness, equality and do-goodism. Here's a better idea: As Moore suggests, “Atlas Shugged” should be “required reading for every member of Congress and political appointee in the Obama administration.” Read Moore's essay yourself, and you may be e-mailing it to your friends and relatives, too. Maybe even to your members of Congress. "Once politics become a tug-of-war for shares in the income pie, decent government is impossible."
"I have studied the climate models and I know what they can do. The models solve the equations of fluid dynamics, and they do a very good job of describing the fluid motions of the atmosphere and the oceans. They do a very poor job of describing the clouds, the dust, the chemistry and the biology of fields and farms and forests. They do not begin to describe the real world that we live in. The real world is muddy and messy and full of things that we do not yet understand. It is much easier for a scientist to sit in an air-conditioned building and run computer models, than to put on winter clothes and measure what is really happening outside in the swamps and the clouds. That is why the climate model experts end up believing their own models. Parks and Recreation. Arlington spends the most per capita ($175.59) followed by Alexandria ($158.28) with Prince William the lowest ($65.11). Cultural Enrichment. Arlington spent $16.65 per capita with Falls Church the highest ($45.91) and Fairfax County the lowest ($1.39). Public Libraries. Arlington ranked second, spending $73.62 per capita. Falls Church spent the most per capita ($158.60) while Prince William spent the least per capita ($34.93). As we growled previously, the Arlington School Board cooperates with other regional school districts to produce a useful report -- the WABE Guide -- that would enable taxpayers to compare the performance of Arlington government entities that goes beyond just the cost per capita. Today we continue analyzing the cost of the services provided by Arlington County. On December 31, we reviewed the broad categories of local government in Arlington County, noting that for health and welfare Arlington spent $668.60 per capita in FY 2007 with other local jurisdictions ranging from $196.81 (Loudoun) to $685.00 (Alexandria). Data comes from the Comparative Report of Local Government Revenues and Expenditures, published by the Virginia Auditor of Public Accounts. Now, we growl about the components of health and welfare, which are health; mental health and mental retardation; and, welfare and social services. We compare Arlington to other Northern Virginia jurisdictions. Health. Arlington spends the most per capita ($103.04). The others range from Fairfax County ($70.18) to Falls Church ($13.59). Mental Health and Mental Retardation. Alexandria ranks at the top, spending $208.71 per capita. Arlington spends $112.94 per capita. Others range from Fairfax County ($133.77) to Prince William County ($61.49). Welfare and Social Services. Arlington spends the most per capita ($452.62) with the others ranging from Alexandria ($421.37) to Prince William ($173.19). As we growled on Sunday, even the Arlington School Board cooperates with other school districts in the region to produce a useful report that enables taxpayers to compare performance. The complete tables will be in the next issue of the newsletter, The ACTA Watchdog. "By the way, had the teachers' union been around when Sam Adams threw tea into the harbor, they would have run ads against him." To subscribe to the weekly Communique, visit EIA's "contact" page. Two weeks ago, we growled about the cost of various services of county government, noting that Arlington is among the “top spenders “ of Northern Virginia’s local jurisdictions on a per capita basis. We used data from the Comparative Report of Local Government Revenues & Expenditures for FY 2007 published by the Virginia Auditor of Public Accounts. In the Public Safety category, Arlington spent $826.94 with Alexandria the “runner-up” at $786.29 while Loudoun County was the lowest at $423.75. Today, we’ll take a closer look by focusing on three components of Public Safety: Law Enforcement & Traffic Control; Fire and Rescue Services; and Correction and Detention. Law Enforcement & Traffic Control. Falls Church spends the most at $404.79 followed closely by Alexandria at $390.52. By contrast, Arlington spends $304.40 per capita with Loudoun County spending only $159.33 per capita. Fire & Rescue Services. Arlington spends the most at $296.08 followed by Alexandria at $223.01 per capita. By contrast, Falls Church spends only $155.01 per capita. Correction & Detention. Falls Church is tops at $154.11 per capita followed closely by Arlington at $153.78 per capita. Spending the least on a per capita basis in Northern Virginia is Fairfax County at $64.03. If the Arlington County Board required the Manager and his department heads to periodically explain the differences in per capita spending among Northern Virginia jurisdictions, they might learn that some things are being performed inefficiently while some things might have little or no payoff in terms of providing safety to county residents. Do ya’ think? Even the Arlington School Board cooperates with other school districts in the region to annually produce the WABE Guide, which enables taxpayers to compare the performance of the Arlington Public Schools with other districts in the region. “Assessed values of single-family homes across Arlington will be down only slightly when updated assessments are mailed to homeowners later this month, according to preliminary data released by the county government. "County officials said the average assessment of a single-family property would decline 2 percent, from $530,100 to $520,100, for a second year of declines - but far from the double-digit declines that are being experienced by homeowners in the outer suburbs. A more detailed description of real estate values in the county is available in this December 30 press release from the county’s spinmeisters. We looked at 15 properties that sold in the last four months of 2008, and the results pretty much confirm what the Sun-Gazette says about the assessments varying by location and type of home. The location of those 15 properties will be included in the forthcoming issue of ACTA newsletter. Assessments are only one-half of the equation for property taxes. The other half -- tax rates -- will be set by the County Board in April. What Would Mr. Jefferson Think Today? “Francis said in a statement that “the US government should actively support the adult industry's survival and growth, just as it feels the need to support any other industry cherished by the American people." HT Citizens Against Government Waste’s “Swine Line” blog. Politicians And Lobbyists In Cahoots? The peerless Norm Leahy, blogging yesterday at Tertium Quids, wonders why Delegates Terry Kilgore (R) and Chris Jones (R) would “ seek to give state pensions to employees of the Virginia Municipal League and (the Virginia Association of Counties).” VML and VACo are lobbyists, which together currently cost Arlington County taxpayers about $90,000 annually. President Reagan awarded Eric Hoffer the Presidential Medal of Freedom in 1983. For more about Eric Hoffer, see his Wikipedia entry. The quote above is from OnPower.org. "The problem with government is that it doesn’t actually make any money. It only spends it. As such it is perpetually caught between the desire to get its hooks on cash and the necessity to leave some seed corn for future harvests. This is called public policy." El Growler Grande will be away until the middle of next week.